The grand opening of the Rex Theatre in 1923 enjoyed the distinction of premiering a full-length silent film. An eager Priest River audience filled the auditorium as the local band played. 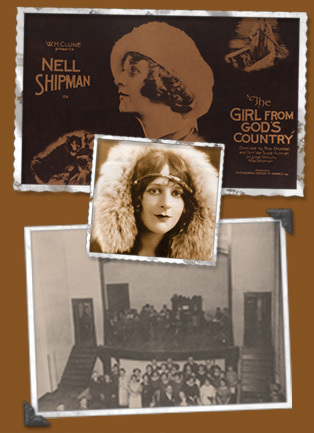 Then actress and independent film producer Nell Shipman presented her newest movie, “The Grubstake” before it was nationally released. Filmed in part at Priest Lake, the movie portrayed a young woman falsely lured to Alaska by a gambler with promises of marriage and a grubstake for a gold mine. Located at the north end of the new Beardmore Block, the Rex offered viewers an experience similar to the movie palaces in bigger cities. Filmgoers entered through its wide doors set back off the sidewalk, paying outside at the box office and then stepping into the red velvet curtained auditorium for escape into the weekly movie presentations. The Rex opened with state of the art equipment to featured silent films but the end of the 1920s made the transition to talkies. The Rex Theater entertained several generations of Priest River audiences and operated through the 1950s under the name Roxy. 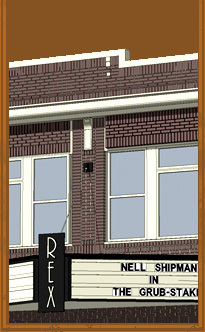 The doors of the renovated Rex Theater will once again open soon, and feature both motion pictures and performing arts. We all look forward to its opening with anticipation after a 50 year wait.